Doncaster RLFC will go into the League One Super 8s the weekend after next on a high after claiming their third successive win. 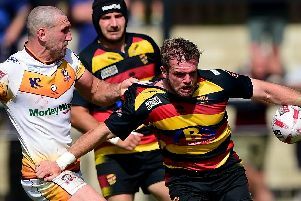 They ended their regular League One campaign when posting a 42-4 victory over University of Gloucestershire All Golds at the Prince of Wales Stadium. Although the Dons failed to claim fourth spot from York City Knights, who boast a better points difference, they did improve on sixth place as a result of Hunslet’s dramatic 25-24 win over Newcastle Thunder. That means the Dons, beaten play-off semi-finalists last season, will be away in four of their seven games in the Super 8s when the competition starts within the next fortnight. “It doesn’t matter whether we are at home or away they are all going to be tough games and we’ll be playing at a higher standard than in the last three games and we know we’ll have to raise our game,” said head coach Richard Horne. Despite the Dons only leading 6-0 at the break, Horne said: “We were dominant and although we only scored one try we didn’t do a lot wrong except for the final pass not hitting the target on a couple of occasions and dropping the ball in the final third at times due to the greasy ball. “We wore them down in the first half and then did a really job of executing our chances in the second. “We also defended really well and they only scored from a kick near the end so overall it was a pleasing performance. He added: “Some guys in the forwards who haven’t played a lot recently got some good game time and that will benefit them ahead of the 8s.